Sonar Genesis Aquatic Herbicide is a fluridone-based formulation for the management of aquatic vegetation in freshwater ponds, lakes and reservoirs. 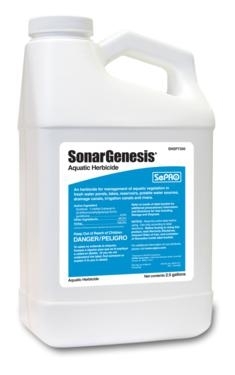 Sonar Genesis Aquatic Herbicide is a highly effective aquatic herbicide used to selectively manage undesirable aquatic vegetation in freshwater ponds, lakes, reservoirs, rivers and canals. Sonar Genesis Aquatic Herbicide is the latest Sonar formulation innovation from SePro. A new and improved Sonar formulation designed with the applicator in mind Sonar Genesis was designed to be an easier to use formulation that lasts longer in the water and provides a faster knockdown on many floating and emergent weed species. This convenient 1/2 lb. formulation provides a lower cost per gallon product improving operations for applicators. Sonar Genesis Aquatic Herbicide is an improved will remove unwanted weeds from your lake or pond for a year or longer with a single treatment. No other aquatic herbicide on the planet is more effective on duckweed, period. Unlike other aquatic herbicides, Sonar has no restrictions on water use after application. Swimmers can still swim. Fisherman can still fish. Livestock can still drink. Sonar Genesis Aquatic Herbicide is absorbed through the leaves, shoots, and roots of susceptible plants, and destroys the plant by interfering with its ability to make and use food.